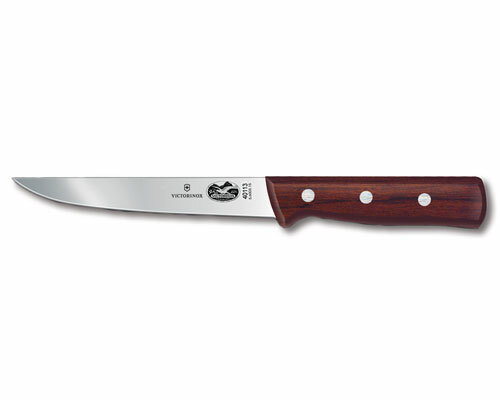 The Victorinox Rosewood 6 in. Wide Stiff Boning Knife is stamped, made of high carbon stainless steel. This boning knife is great to use when separating meat from bones of poultry and other meats. The Victorinox Rosewood 6 in. Stiff Boning Knife is a stamped knife, made of high carbon stainless steel. This stiff boning knife is ideal for boning beef and pork. 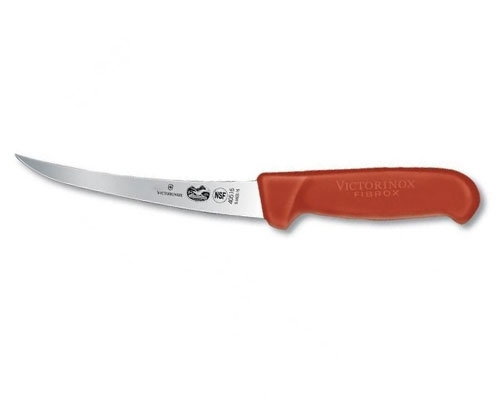 The Victorinox 5 inch narrow and flexible blade is a very good choice for fileting small freshwater fish like trout, and for removing bones from poultry while leaving the carcass intact. The Victorinox 6 in. Rosewood Flexible Boning Knife has a thin, flexible blade that is nicely suited for boning out small fish. The Victorinox Rosewood 5 in. Semi-Stiff Boning Knife works well as a steak knife. 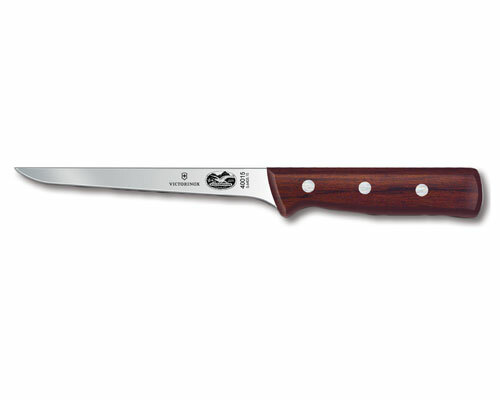 The big rosewood handle and curved blade remind me of the knives offered in old Chicago style steak, rib and chop houses. The Victorinox Rosewood 6 in. Semi-Stiff Boning Knife is a stamped knife, made of high carbon stainless steel. This boning knife is semi-stiff and curved. Great to use for deboning poultry and other meats as well as filleting fish. Also can be used as a steak knife. The Victorinox Rosewood 5 in. Flexible Boning Knife is perfect for deboning chicken, ham, ribs and other meats. The flexible blade provides better control. The Rosewood handles and shape of this boning knife are reminiscent of steak knives from 1930's Chicago style steak rib and chop houses. Very comfortable and easy to maneuver. 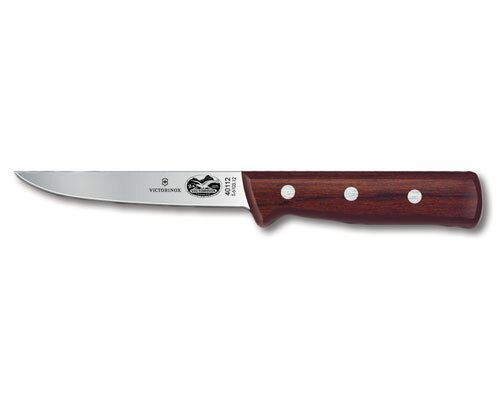 The Victorinox Rosewood 6 in. Flexible Boning Knife is a stamped knife, made of high carbon stainless steel. This boning knife is a great tool to have when deboning poultry and other meats. A flexible blade provides more control. The Victorinox Forschner 5 inch wide boning knife has a straight, stiff blade which works very well for breaking out chuck roasts. 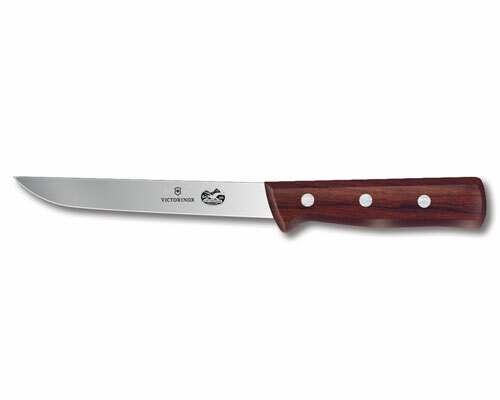 The Victorinox Victorinox 6 inch straight boning knife features a wide, stiff blade. Easily break through joints, trim bones and cartilage and slice chops. The Victorinox Rosewood 6 in. 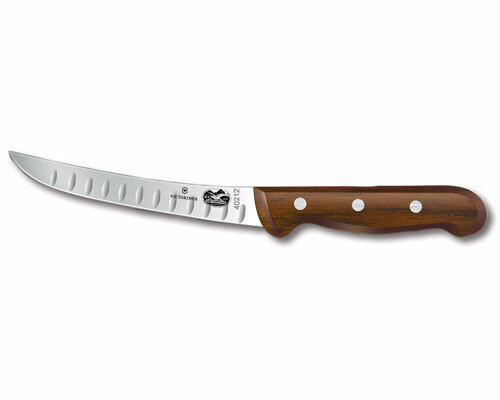 Wide Semi-Stiff Boning Knife is a stamped knife, made of high carbon stainless steel. This boning knife is semi-stiff and curved. Great to use for deboning poultry and other meats as well as filleting fish. Also can be used as a steak knife. The Victorinox Rosewood 6 in. Wide Granton Semi-Stiff Boning Knife's semi-stiff blade resharpens easily with a honing rod. The curved blade makes it easy to thin fat caps and remove silver skin. Wide blade is helpful in separating joints. Victorinox 6 in. Semi-Stiff Curving Boning Knife has a red Fibrox handle. This knife is ideal for trimming fat and portioning meats and poultry. Victorinox 6 in. Semi-Stiff Curving Boning Knife has a Blue Fibrox handle. This knife is ideal for trimming fat and portioning meats and poultry. The yellow Fibrox 6 in. Semi Stiff Curved Boning Knife is great to use for deboning poultry and other meats as well as filleting fish. The curved angle gives you a glided slicing motion when cutting. 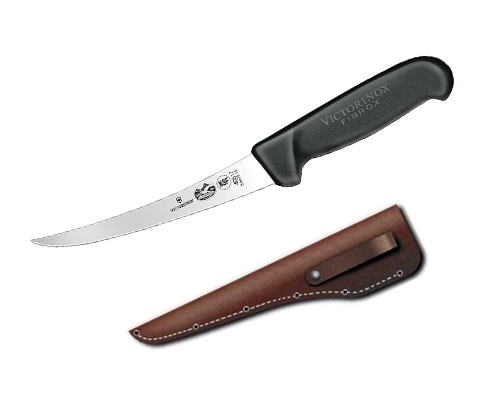 The Victorinox Fibrox 5 in. Narrow Stiff Boning Knife is a stamped knife, made of high carbon stainless steel. This boning knife is straight, narrow and stiff. Great for deboning poultry and other meats. 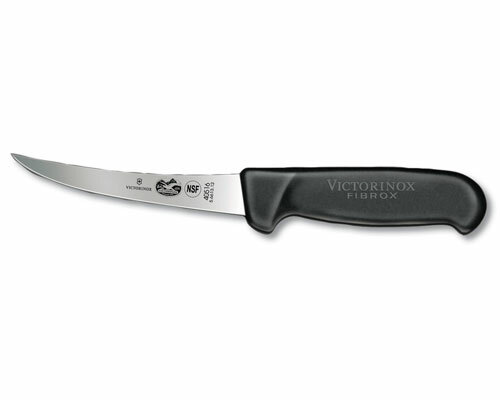 The Victorinox Fibrox 6 in. Narrow Stiff Boning Knife is stamped, made of high carbon stainless steel. Great for deboning poultry and other meats. Can also be used as a fillet knife. The Victorinox Fibrox 6 in. Narrow Stiff Boning Knife is stamped, made of high carbon stainless steel. Great for deboning meat and poultry as well as fileting fish. The leather sheath is designed to be worn on a standard belt and is perfect for fishermen. 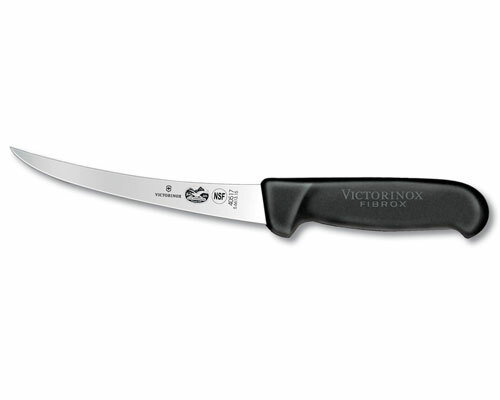 The Victorinox Fibrox 5 in. Flexible Boning Knife is the ideal "all purpose" boning knife. Suitable for fileting fish in addition to boning meats, pork and poultry. The Victorinox Fibrox 6 in. Flexible Boning Knife is an all purpose boning knife that is suitable for boning meats, or filleting fish. 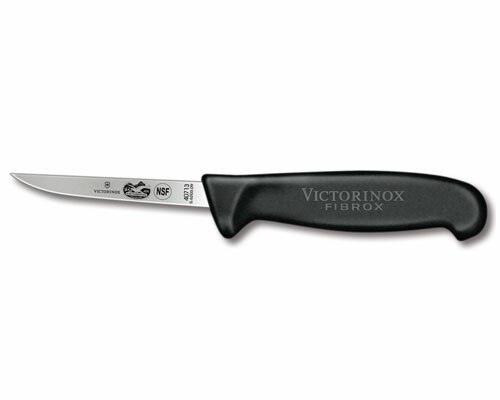 The Victorinox Fibrox 5 in. Semi-Stiff Boning Knife has just a bit of flex. This knife is used in the meat industry for breaking out the chuck roast. Useful for poultry and trimming fat, but also used for dressing deer and elk in the field. 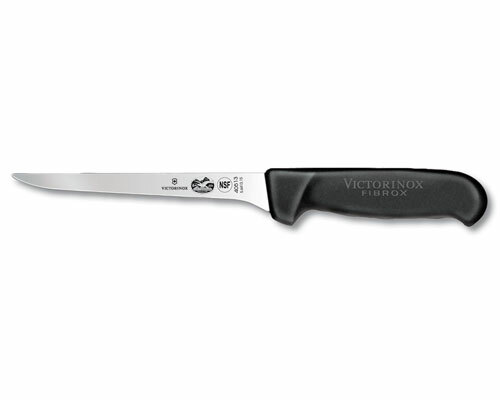 The Victorinox Fibrox 6 in. Semi-Stiff Boning Knife works well as a steak knife. The large fibrox handle and curved blade reminds me of the knives offered in old Chicago style steak, rib and chop houses. 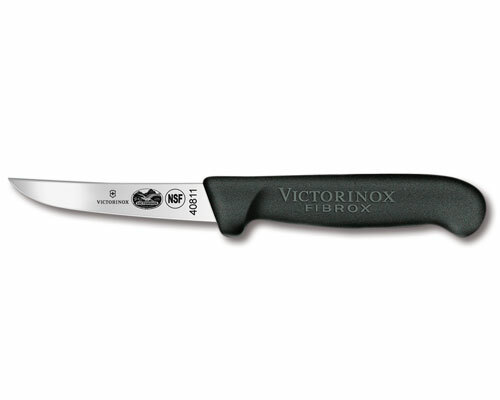 The Victorinox Fibrox 5 in. boning knife features a flexible blade that is thin, making it ideal for boning out small fish and removing silver skin from meats. May also be used as any other boning knife, but when you make a knife flexible, you lose some edge retention. So if the intended usage is for more rigorous work, please consider item 40514 semi-stiff blade. The Victorinox Fibrox 6 in. Flexible Boning Knife is a stamped high carbon knife with a Fibrox handle. This boning knife is curved and flexible. Great for deboning poultry and other meats. Can also be used as a fillet knife. The Victorinox Fibrox 6 in. Flexible Boning Knife is a stamped high carbon knife with a Fibrox handle. This boning knife is curved and flexible. Great for deboning poultry, meats and fileting fish. The leather sheath protects you and the blade and is designed to be worn on a standard belt. The Victorinox Fibrox 5 in. 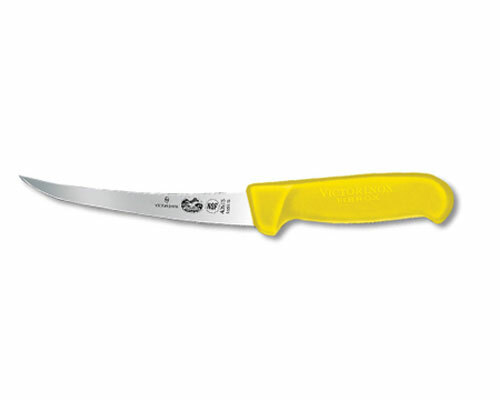 Semi-Flexible Boning Knife has a thin, semi-flexible blade that is nicely suited for boning out small fish. 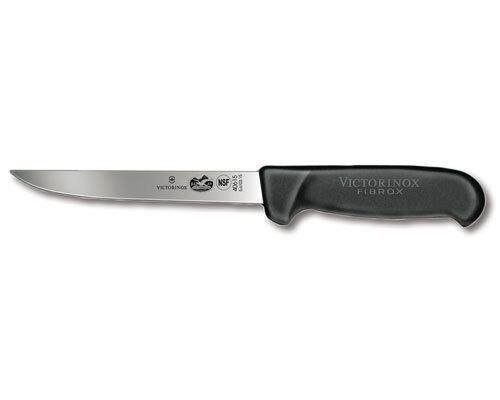 The Victorinox Fibrox 6 in. Narrow Semi-Flexible Boning Knife has a straight and narrow blade. Great for deboning poultry and other meats. Can also be used as a fillet knife. The Victorinox Fibrox 6 in. Stiff Boning Knife is great for deboning poultry and other meats. Can also be used as a fillet knife. The Victorinox 6 in. 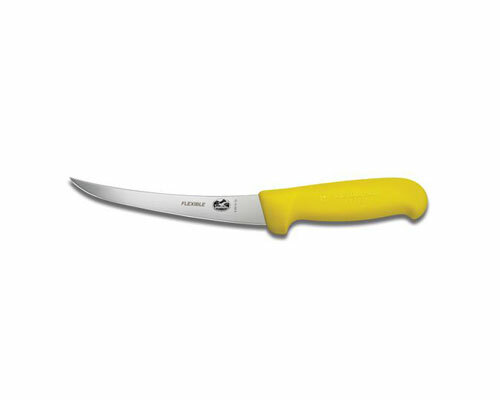 Straight Stiff Extra-Wide Boning Knife is great to use for deboning poultry and other meats. The extra width provides some versatility in that it may double as a flank and shoulder knife.It will also survive more re-sharpening due to the extra width. 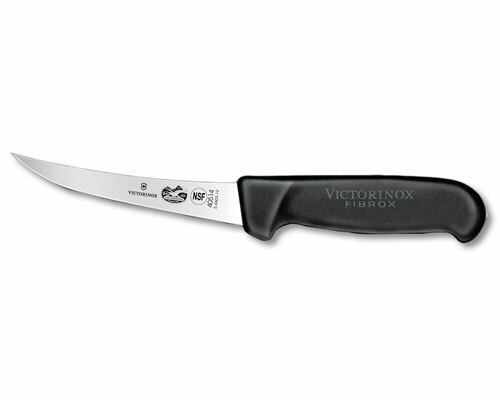 The Victorinox Fibrox 5 in. Stiff Boning Knife makes it easy to break through joints, trim bones and cartilage and slice chops. 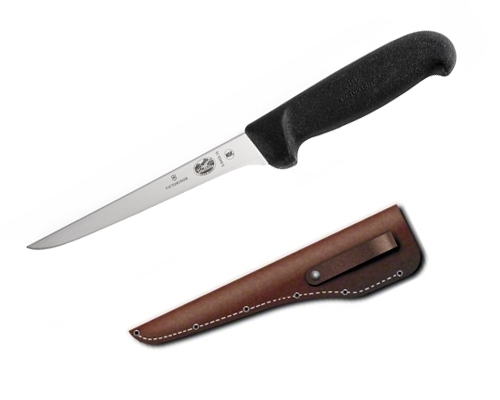 The Victorinox Fibrox 6 in. Stiff Boning Knife makes it easy to break through joints, trim bones and cartilage and slice chops. 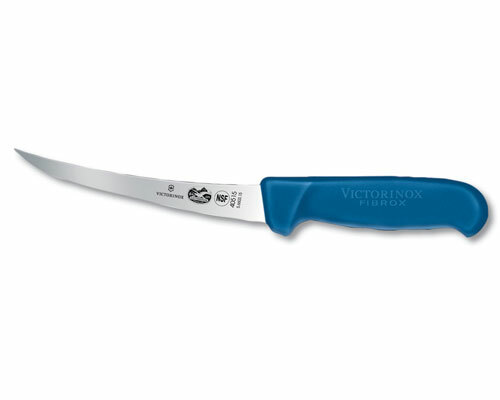 The Victorinox Fibrox 3 in. Chicken Deboning Knife features an over sized Fibrox handle on this knife makes for an easy to control paring knife as well as chicken boning knife. 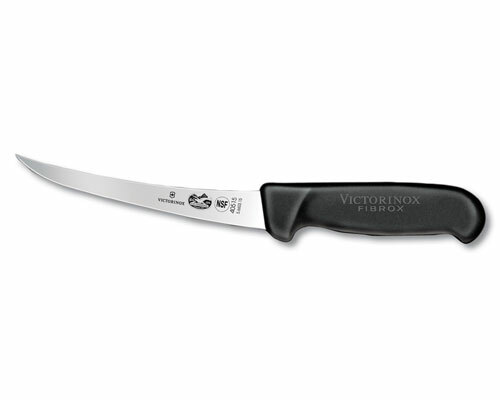 The Victorinox Fibrox 4 in. Rabbit Boning Knife is made to cut rabbit meat, and also used to cut meat into small pieces for soups and stews. 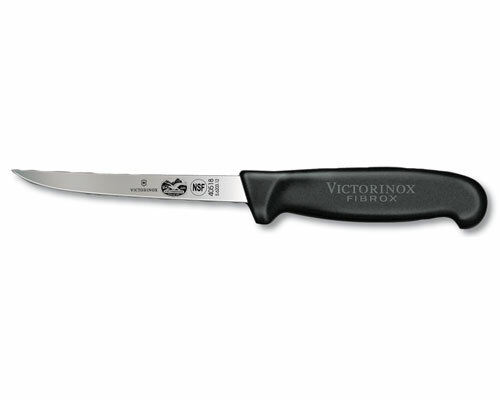 The Victorinox Fibrox 6 in. 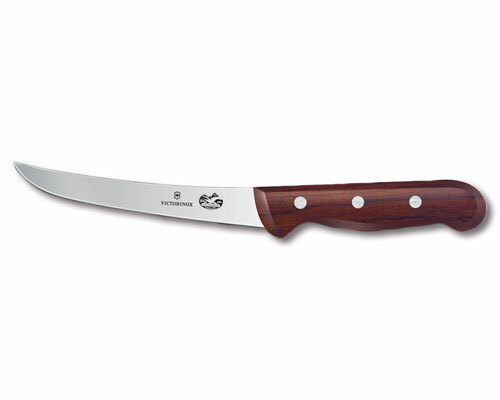 Stiff Granton Edge Boning Knife features a granton edge to prevent foods from sticking to the blade. Great for deboning poultry and other meats. Can also be used as a fillet knife. The Victorinox Fibrox 6 in. Granton Edge Boning Knife is curved with a granton edge to relieve sticking to the blade. Great for deboning poultry and other meats. Can also be used as a fillet knife. 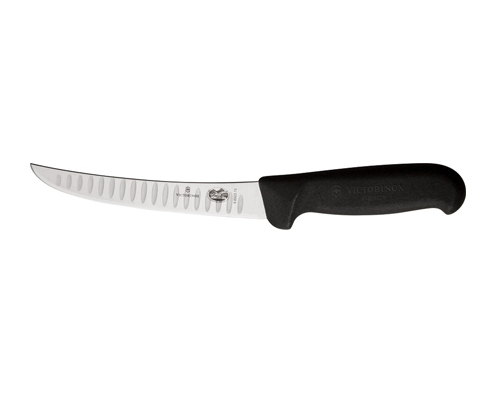 The curved flex boning knife is an excellent choice for anyone looking to remove the bones off poultry and fish. The curved tip gives you a great advantage when working around the edges of bones.